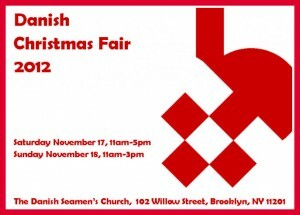 The Danish Seamen’s Church in Brooklyn Heights at 102 Willow Street is hosting its annual Traditional Danish Christmas Fair Saturday, November 17, 11 a.m.-5 p.m. and Sunday, November 18, 11 a.m.-3 p.m.. The gift shop and courtyard bar serving hotdogs, Danish beer, warm pastries and mulled wine will be served at the Danish Seamen’s Church; while open-faced sandwiches and beer will be hosted by Plymouth Church at 75 Hicks Street. Note that the restaurant at Plymouth Church is open Saturday only, while the Danish Church is open both days. All proceeds from the Christmas Fair go toward supporting the church and its activities. For more info, see here. Reminder: Halstead Packs Van To Rockaways Monday 11/12 At 9 A.M.